Nick Santa Cruz went out for his sophomore season at Rancho Santiago, putting up a .335 batting average and knocking in 10, according to The Los Angeles Times. It was enough for Santa Cruz to get the notice of the Phillies, and for Santa Cruz to forgo his final two years on the college field to turn pro. Had he stayed in college, Santa Cruz would have had those final two seasons. Turning pro, Santa Cruz got just three, never getting close to the majors. 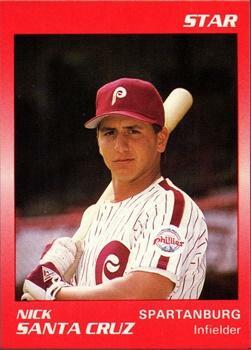 Santa Cruz turned pro in 1988, taken by the Phillies in the 14th round of the draft out of Rancho Santiago. At Rancho Santiago, Santa Cruz knocked in one of those runs in a March game. He also had two hits in one March 1987 game, in his freshman year. With the Phillies, Santa Cruz started at short-season Batavia, hitting .215 in 59 games. He also knocked in 18. For 1989, Santa Cruz moved up to single-A Spartanburg, but he got into just 39 games on the year. In those games, he hit .233. He singled in a run in a May game and walked and scored in a June game. Santa Cruz' career lasted into just one more season, a season that, for Santa Cruz, turned out to be brief. Returning to Spartanburg for 1990, the infielder got into just 12 games, getting seven hits in 33 at bats. They were the final 12 games of Santa Cruz' career.